← Ogoun? Oh, Go On! Sprout Mask Replica – Rankin expands his fictional author’s biographies into an entire fictional autobiography, which also extends to his family. Sprouts appear quite frequently in the story, including Barry the Holy Guardian Sprout, who this time is in Rankin’s own head. While there are a lot of tangents, much of the plot revolves around chaos theory, and how the author discovers he can make major changes through seemingly random actions. I wish being obsessive-compulsive really worked like that! Anyway, it isn’t one of Rankin’s more memorable novels, but it’s pretty funny. In addition to Barry, there are guest appearances by several of his other recurring characters. And yes, the title’s reference to a Captain Beefheart album is acknowledged. The Brentford Chainstore Massarcre – This book is a return to Rankin’s original heroes, Jim Pooley and John Omally of Brentford. It’s also a return to the titles that sound cool but don’t directly relate to the plot. The overlapping plots this time around involve a mad doctor who is attempting to clone Jesus, and the discovery that a set of scrolls from the Vatican will allow Brentford to celebrate the millennium a few years early. As might be expected, there’s also a demonic being, this time the head of the Millennial Committee who sold his soul to Satan. While much of it has a done-before sort of feeling, it’s a good read, and has some interesting and amusing new ideas. The Dance of the Voodoo Handbag – The follow-up to Sprout Mask Replica is more focused than its predecessor. Since it’s Rankin, it still isn’t THAT focused, but it does follow one basic plot. There’s a company called Necrosoft that has discovered how to download personalities onto the Internet, which turns out to also be the world of dreams and the mind of God. Rankin’s fictional self runs afoul of Billy Barnes, the ruthless second-in-command to Henry Doors, owner of Necrosoft. He finds himself trapped in the Necronet, with his only hope being to outsmart Billy. The titular handbag, which belongs to the voodoo goddess Erzulie and is a gateway between the worlds of the living and the dead, also plays a role. 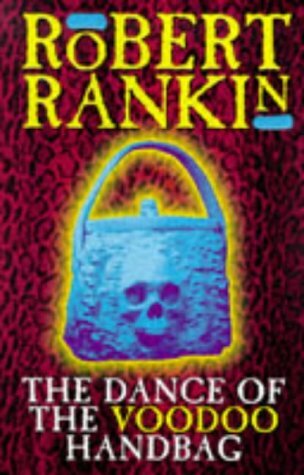 I’ve seen Sprout Mask Replica and this one listed as parts of a trilogy with Waiting for Godalming as its final volume, but while that one starts in a very similar manner to Dance, its protagonist is not Rankin himself. Overall, these were not three of Rankin’s best, but they were still enjoyable. Besides, I do plan to eventually read all of his books, which includes the weaker ones. This entry was posted in Authors, Book Reviews, Brentford Trilogy, Robert Rankin and tagged barry the sprout, erzulie, jim pooley, john omally, sprout mask replica, the brentford chainstore massacre, the dance of the voodoo handbag. Bookmark the permalink.